Since the first soup we made out of Anna Thomas’s Love Soup was such a success (albeit a bit labor intensive! 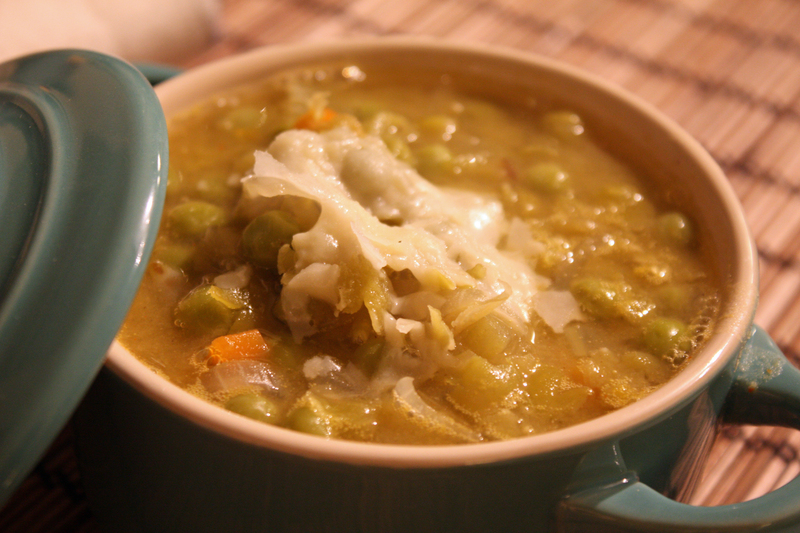 ), I was excited to try the second soup in the book that caught my eye: “Carol’s Finnish Pea Soup with Apples.” This soup sounded interesting for several reasons. First, the name–who wouldn’t be enticed with title like that? Second, the ingredients: split peas and frozen green peas, dijon mustard, and an apple–I was intrigued! Learning from my past mistakes, I actually read the entire recipe before starting this time and decided to pre-chop and pre-measure everything before beginning, which, strangely enough, made the entire process a whole lot easier. Funny how that happens. Also, this recipe is much more traditional throw-everything-into-a-pot-and-let-it-simmer kind of soup which helped the process just a bit. Of course, you’re not getting away that easy: there were a few additional steps required! I was pretty excited about one of them: peeling and coring the apple. Now, you could just do this the boring way and use a peeler and a knife and all. Or you could use one of these. Honestly, using my apple corer was probably the main reason I chose to make this recipe. I love it! We used to have them at the preschool I went to and I’ve been in love with them ever since. 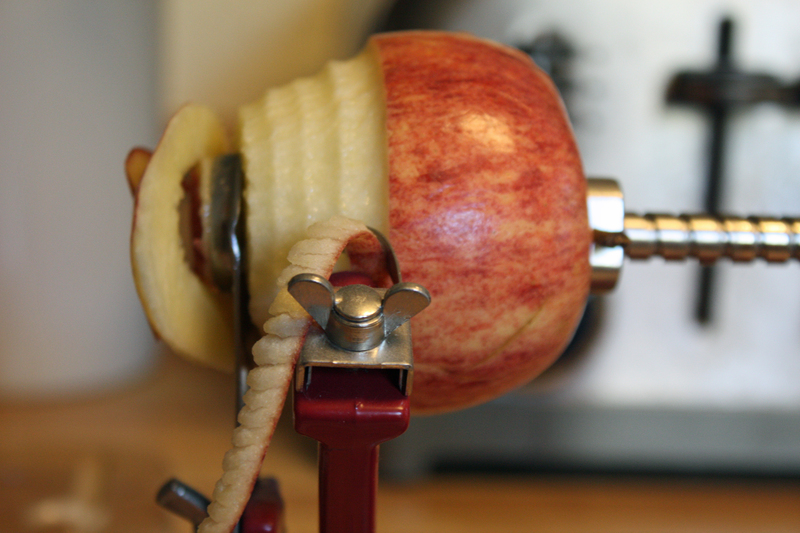 All you have to do is crank the handle and the machine magically creates a fun peeled and cored spiral apple. Cool, right? 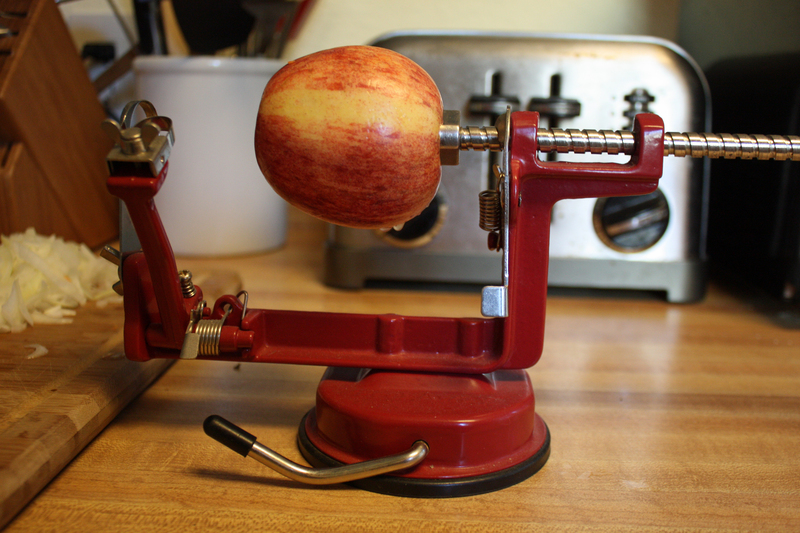 The corer is also a great time saver for making apple pies or a fun kid friendly kitchen activity. Or just entertaining to use if you’re a nerd like me. They’re not that expensive either! Jeff and I had also received a cast iron griddle and griddle press for Christmas, so we decided to make paninis with fresh homemade foccacia. This is what happens when I have too much time on my hands! 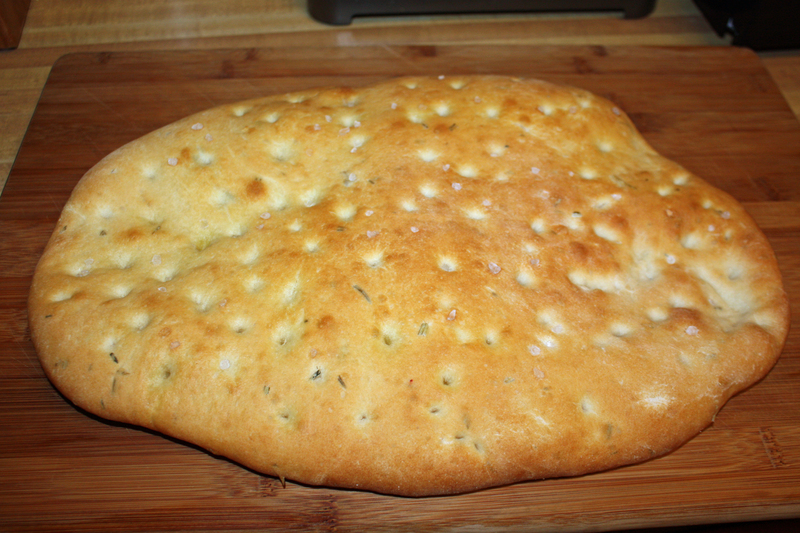 Foccacia is one of the easiest breads to make and only requires a short rise–about 1 hour. 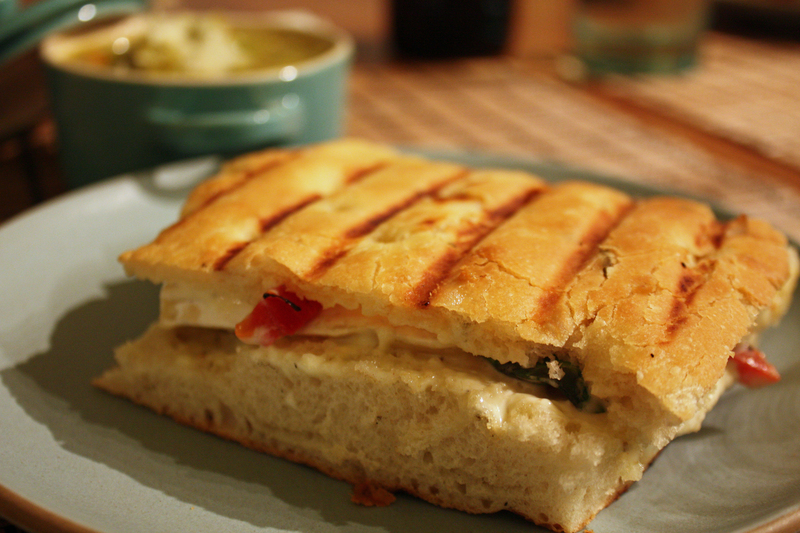 For the paninis themselves, we just added whatever we had in the fridge that sounded good: brie, marinated artichoke hearts, marinated red peppers, basil with a good ol’ garlic lemon aioli. A lot like these actually. 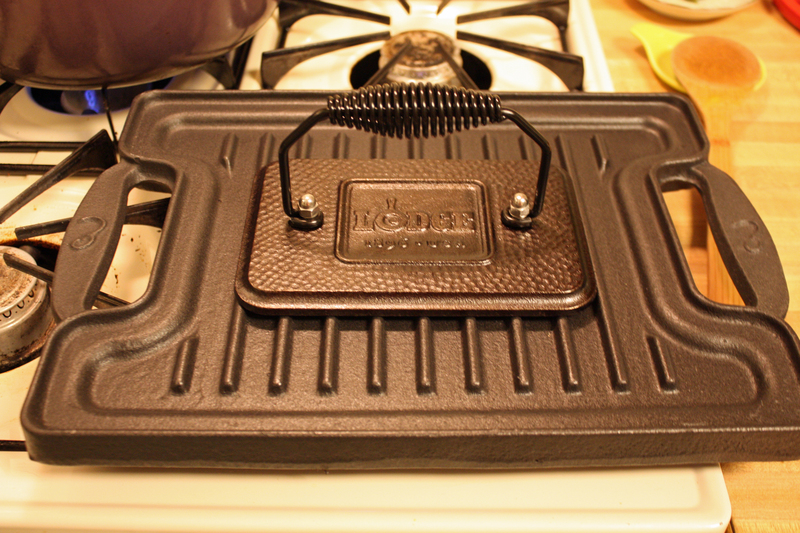 The griddle press was pretty fun to use too! Can you tell this meal was all about fun kitchen gadgets? 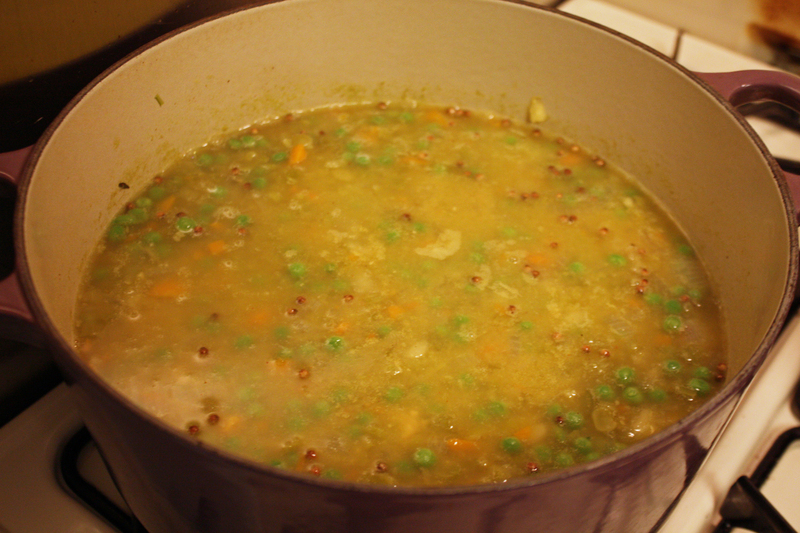 Rinse the split peas and add them to a large pot along with the carrots, celery, thyme, bay leaf along with 6 cups of water. Bring to a boil then cover and reduce to a simmer and cook for about half an hour. Heat up 1 tablespoon of the olive oil in a large pan over medium heat. Add the onion with a pinch of salt and saute, stirring often, until the onion is aromatic, soft, and light brown, about 3-4 minutes. Add to the onion to the soup along with the apple and let simmer for another 15 minutes. At the end of the 15 minutes, add the remaining ingredients: peas, coriander, mustard, cider vinegar, broth, cayenne, and pinch of salt. 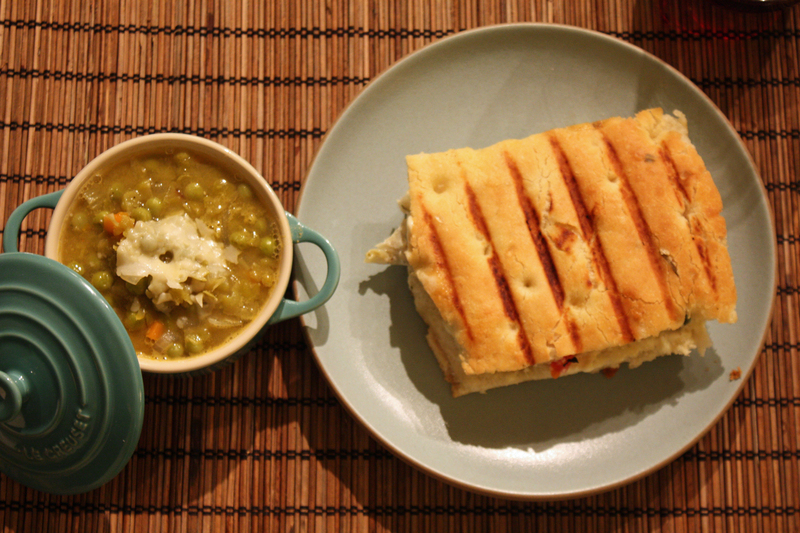 Serve with paninis or bread or whatever, and enjoy!